A couple of days ago, we highlighted some great pro-podcasting propaganda (right) that Magnatune, a net music label that specializes in Creative-Commons Music, is using. 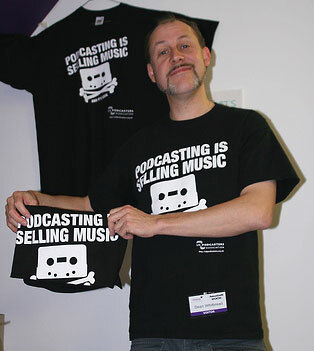 The Podcasting is Selling Music logo parodies a 1980‚Äôs campaign by the British Phonograph Industry, Home Taping is Killing Music. UK Podcasters Association (UKPA) founder Dean Whitbread contacted us and let us know how deep the rabbit-hole goes. The graphic actually comes from a UKPA promotion. The Podcasting is Selling Music logo is Creative-Commons licensed. The original is available at the UKPA site.